Yes – dieting and losing weight currently becomes a wide concern for us nowadays however sometimes we tend to forget our objective and goal for our own diet and weight loss effort. It is true, isn’t it? As we are already in the holiday season, people start to be aware of what they eat and one of the most popular questions is – How about my weight? 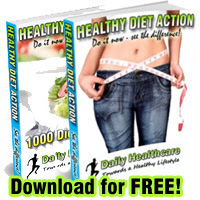 Based on this fact, we prepare Healthy Diet Action for you – it’s FREE – this set can help you in understanding your motive of weight loss and dieting and besides that we have included some software that can help you in tracking your diet progress and monitoring the information of nutrition that you consume daily. Do it now – and see the difference!